Armed Forces Information and Education, US Department of Defense, A Pocket Guide to Vietnam, 1962. Pamphlet, Collection of New-York Historical Society. A Pocket Guide to Vietnam is a 75-page pamphlet detailing Vietnamese culture and history. It was produced in 1962 by the US Department of Defense in order to aid in American personnel’s transition into Vietnam. 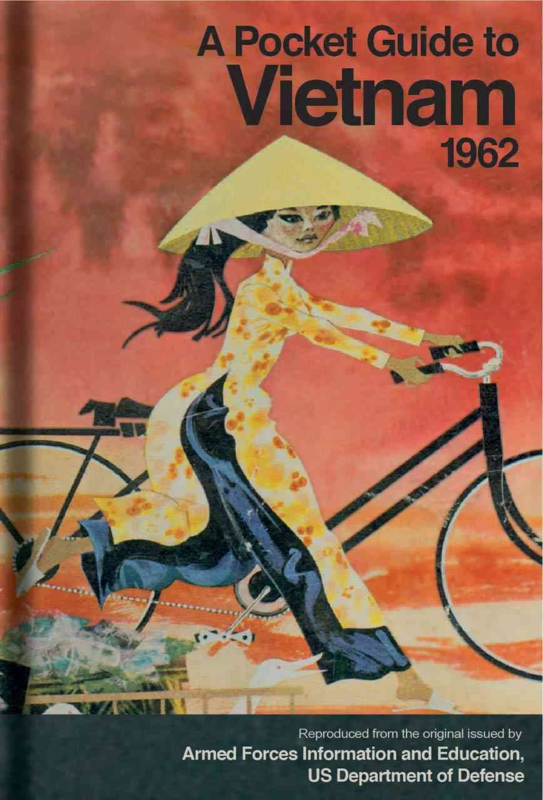 The colorful cover depicts a Vietnamese woman riding a bicycle and wearing a conical hat. American involvement in the Vietnam War began in large numbers at the start of the 1960s and heightened as the decade wore on, with a peak of more than 500,000 American personnel by 1969. Entering the war, these men and women were thrust into Vietnam with little knowledge of the environment, language, or culture of the country, and Vietnam would oftentimes be their first time traveling out of the United States. Difficulties assimilating into Vietnamese society compounded the dangers they faced in the jungle against guerilla fighters. A Pocket Guide to Vietnam attempted to lessen the impact of this culture shock by informing Americans about the simple aspects of daily life. The pamphlet outlines the “Nine Rules for Personnel of U.S. Military Assistance Command, Vietnam.” These rules educate Americans on how to remain respectful of Vietnamese communities and people and also include information on Vietnamese history, family structures, social customs and manners, and government structure. Additionally, the “Nine Rules” emphasize that Americans are guests in Vietnam and that they should not seek special treatment from the locals. The pamphlet focuses a great deal on the dangers that Communism poses to the world. It describes the U.S. as “helping a brave nation repel Communist aggression.” Therefore, in addition to its assimilation tips for Americans, this pamphlet also acted effectively as anti-Communist propaganda. A Pocket Guide to Vietnam. The Department of Defense (1962). Mirsky, Jonathan. “Advice for Soldiers in Vietnam: ‘The Fish is Good.’” The New York Review of Books. Accessed August 10, 2017. http://www.nybooks.com/daily/2012/08/20/department-defense-guide-vietnam/. “Vietnam War Soldiers.” Alpha History. Accessed August 10, 2017. http://alphahistory.com/vietnamwar/vietnam-war-soldiers/.